In this short video we will discuss the protocol for determining which size tourniquet to use and our recommendations for occlusion locations. The first step in determining which size HemaClear® to use is to decide on desired occlusion location. The following occlusion locations are our recommendations for HemaClear® placement. For procedures where upper arm occlusion is desired, place HemaClear® proximally to the bicept. For procedures where occlusion on the forearm is desired, place HemaClear® approximately 10 cm from the wrist. Use caution not to place HemaClear® on the ulnar nerve. For procedures where occlusion on the proximal thigh is desired, place HemaClear® as high as possible on the thigh. It is imperative to place HemaClear® as high on the thigh as possible to ensure that themoral flow is captured. If you wish to place HemaClear® below the knee, we recommend an occlusion location of approximately 15 cm above the ankle. 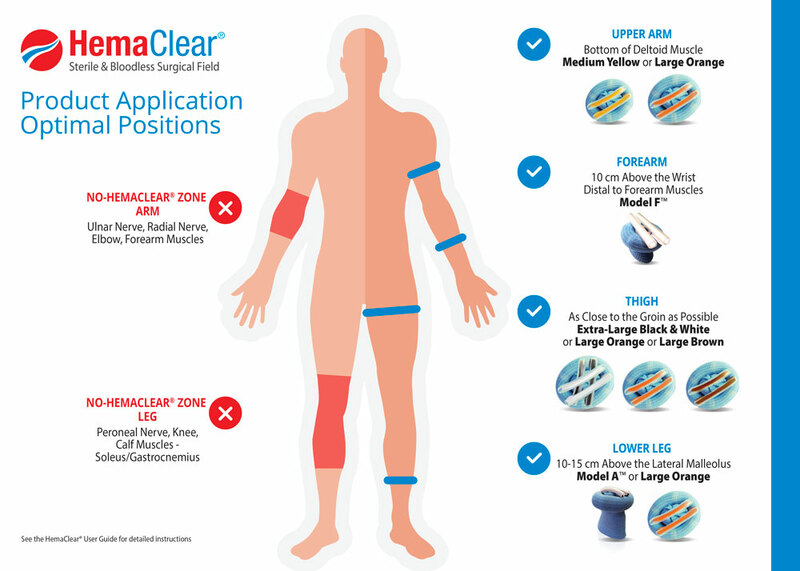 Once your desired occlusion location has been determined, simply grab a HemaClear® Measuring Tape. 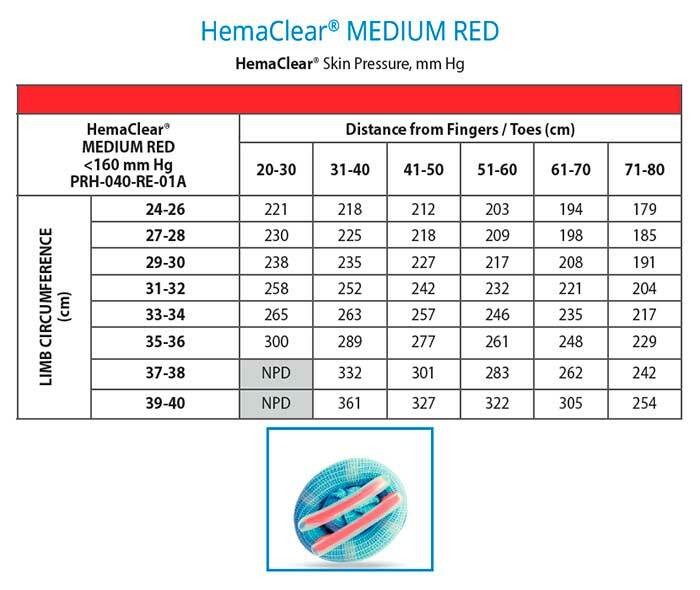 HemaClear® Measuring Tapes can be found in the center of the HemaClear® boxes. Our Measuring Tape can be utilized as sterile measuring tapes or be used unsterile. To properly measure your patient, place the start of the HemaClear® Measuring Tape on the patient. Simply measure circumferentially around your patient. 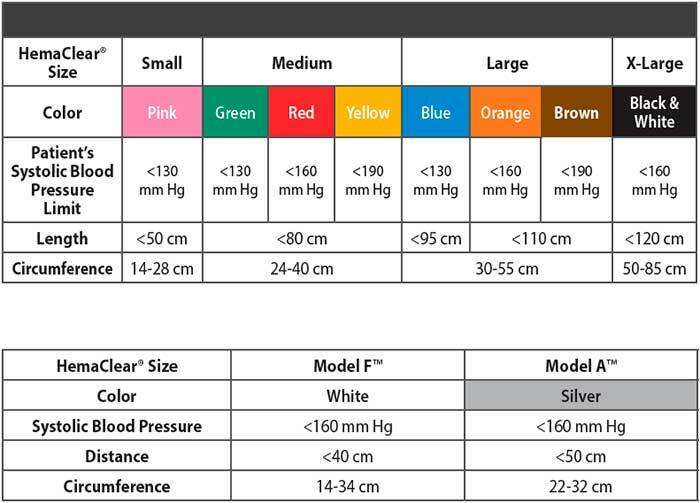 The HemaClear® Measuring Tape is color coordinated to simplify the choice of the proper tourniquet. As you can see, this patient measures 58 cm, which is a HemaClear® Model Black & White. Select the corresponding colored HemaClear®. You are now ready for the procedure. Occasionally, a patient will measure between two HemaClear® sizes. If this occurs, simply opt for the larger size. In this case, a Yellow HemaClear® would be chosen. Identify the HemaClear® Model to be used (e.g. Extra-Large – Black & White). Choose the Table section that matches the Model chosen. Measure the distance between the tips of the fingers/toes and the occlusion location. Find the column corresponding with the distance. 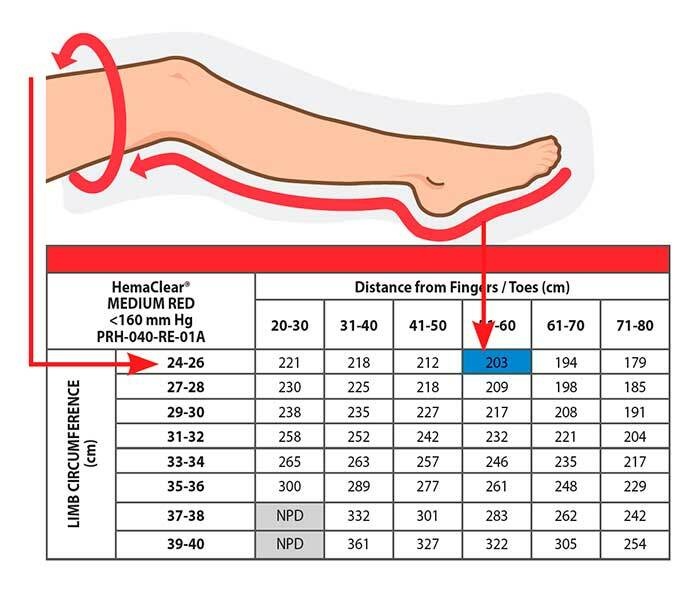 Measure the limb circumference at the occlusion location. Find the row corresponding with the limb circumference. The intersection of the corresponding column and row presents the pressure exerted by the device to the limb at the skin level of occlusion location. 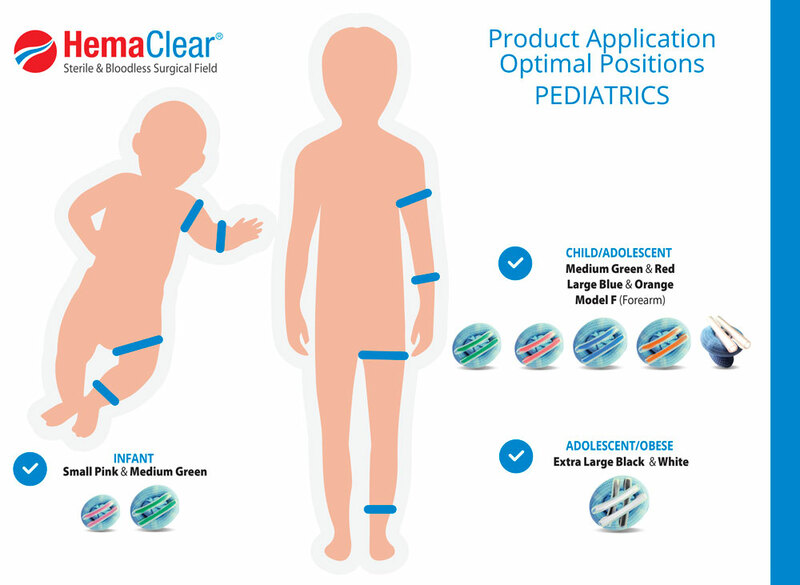 The HemaClear® Measuring-Tape is used in conjunction with the HemaClear® Selection Guide and HemaClear® Pressure Charts while applying the device. It accompanies all HemaClear® products. It is printed on both sides to be used with the full HemaClear® Product Line.